It's new pattern time! 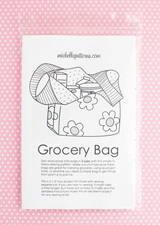 Come take a look at it here on michellepatterns.com or here on etsy. The pattern includes one size, but I made sure to leave you room to print it larger and you can go up to 140%. The footing piece will be cut off, but that's not a piece I'd personally enlarge. It's a rectangle though, so if you want it bigger, draw a rectangle 4x as wide as you'd like the finished footing x 2x + SA for the length. Most sizes of key rings will be fine for this project. I used these black plated ones. You can also find all sorts of fancy key rings on etsy in the supplies category. This pattern is ready to go! Many thanks to everyone who pre-ordered. There might be another pre-order pattern in the future, or maybe there will be a survey so I can get a better idea of what you'd like to sew. You can also send me suggestions. Just keep in mind suggestions can't be too super specific because the project needs to have wide appeal in order for it to make sense to create a pattern. Below are some additional details that aren't in the instructions, and/or some expanded info. Zippers: You can use zippers 1" shorter than the lengths shown in the supply chart. It's easier to make these with a slightly longer zipper, so the lengths in the instructions are slightly longer than necessary. Some of the lengths might also not be common zipper sizes you see at your fabric store, but you can look online or just use the next size up. Both zippers are shortened, so no worries if your zipper is longer than the length given. You can also make an even shorter zipper work for the front pocket by adding fabric at one or both ends to make the total zipper length as long as the pattern piece. If you look closely at the size 4 pouch in the photo above you can see I extended a shorter zipper with some black and white polka dot fabric. I wasn't up for a trip to the fabric store for one zipper! If you use a too short zipper, you'll want at least 0.75" of fabric at each end or the fabric will just get lost in the seam allowance. Which isn't a big deal, but might also look a little odd if there is just a teeny, tiny bit showing on the finished pouch. Attaching the Zippers: For the front pocket you'll need either the zipper foot for your machine, or a 1/4" foot with a guide. I almost always use my 1/4" foot to sew zippers and it works great! It keeps me from sewing too close to the zipper teeth, and is more stable than the zipper foot. 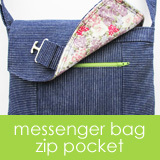 For the side pocket zipper you can use the zigzag foot and don't need a special foot. This zipper is done differently than the zippers in my other patterns, and it's done that way so the front zipper ends up centered on the finished pouch. Pay special attention to steps 7.b & 7.g. If you miss these steps, don't worry, you don't need to remove the zipper and can sew the bottom seams of the exterior and lining with a 1/4" SA. It will be narrow, but just go back and check to make sure you caught all layers. Rectangular Pieces: For this pattern the pieces are rectangular, but the bottom corners are rounded off in 8.f - 8.g in the instructions. Rounding them off is optional, but for most of us rounded corners tend to turn out better than square corners. I really haven't had much success getting square corners--especially with multiple fabric layers--to look square (even with these tips for squares)! They almost always flare out some and rarely look square. Usually I make the pattern pieces with the rounded corners, but have noticed that rounding them off the way it's done in this pattern is working really well and giving better finished results on the corners. A lot of times the seams end up with a section that arcs off course as I come out of the curve of a rounded corner, and the SA is off for a bit until I'm able to steer myself back on course. Sometimes it's not obvious the stitching is off, and sometimes it definitely shows. So try this out and see if it helps with your corners. Fabric Amounts: All four sizes can be made with a FQ of exterior fabric and a FQ of lining fabric. Sizes 2 & 4 can be made with smaller amounts (1/4 & 1/3 yard), but it would need to be laundered fabric in case there is some shrinkage. 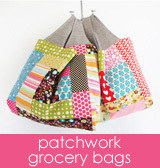 Grading: I didn't grade the seam allowances in these pouches, but you can if you'd like. The canvas can make them a bit thick, but I kind of like them that for these pouches and feel like they add some structure around the outer edges. But feel free to trim some away if you don't like the bulk. Canvas: These pouches have canvas as the interlining for the main pouch. You can substitute fusible fleece (Pellon 987f) if you don't have canvas. Try canvas at some point though if you haven't already used it in a project. It adds a nice bit of weight without a lot of bulk. Make sure to trim the canvas in steps 5.a & 5.b! Also make sure the notches cut in 5.a end up at the end where you attach the zipper. Steps 7.a & 7.f mention this so they are your reminders to check that the canvas is in the correct place. People have asked about a pattern for this type of bag and I'm up for it, but want to make sure you are too. So this one is a pre-order pattern and so far things are going well. This will likely be a go. Come check out some of the details here and if you'd like to go ahead and order now, there is a pre-order discount through 10/6/17. I'll be adding supply info and more sizing measurements this week, so stay tuned! Oh my, so many cords in modern life! These things are out of control, so let's sew some pretty little cord keepers and get them wrapped up and put away, or shortened enough to make them more manageable. Who knows where the idea for this came from, but come it did. At some point I realized the technique used to make the zip pull in the Intro to Improv Zip Pouches could be used to made these cord keepers. It's hard to sew things this small neatly, but this is the trick. Then other sizes started cropping up, and here we are today with a pattern for them! This pattern comes with pattern pieces for 3 sizes, and yes, if you have the Intro to Improv Zip Pouches pattern you might not need this pattern. But you might want it anyway because the fabric pieces need to be a different size than the zip pull, these have interfacing pieces cut to a special sizes, and the pattern pieces in this pattern are super handy. They have the interfacing outlines marked right on them so you can lay the interfacing over them and trace around the outlines, and then there is also some other info you'll want--like the best place for the print you want to show on the front. Small - This is a nice size for small cords like USB cables for cameras or your phone charger. One of these has shortened my camera cable nicely and there's one fewer too long cord slinking around my desk. Medium - This size works for small appliance cords--iron, curling iron, blow dryer, coffee grinder, etc. Finally, you might find your own unique use for these cord keepers. I'm using a few of the ones I've made to get my velvet ribbon and vintage trim under control.